PHE Screening has published an updated information pack to help GPs and primary care professionals advise well men aged 50 and over about prostate specific antigen (PSA) testing for prostate cancer. The PSA test measures the level of PSA in a man’s blood and is the most common initial test for men worried about prostate cancer. However, it is not accurate enough for the UK National Screening Committee (UK NSC) to support it as the basis for a screening programme, which is why the UK NSC's recommendation is not to offer screening for prostate cancer. A raised PSA level can mean a man has prostate cancer, although in some cases it may miss identifying a cancer risk. It can also falsely identify a possible risk of prostate cancer, or find a slow growing cancer that may never cause symptoms or shorten life. This may result in some men opting to have unnecessary treatments with side effects that can affect daily life. The NHS Prostate Cancer Risk Management Programme (PCRMP) has been revised following a rigorous review involving input from GPs, clinicians and patients. It gives clear and balanced guidance on the potential benefits and risks of having the test. 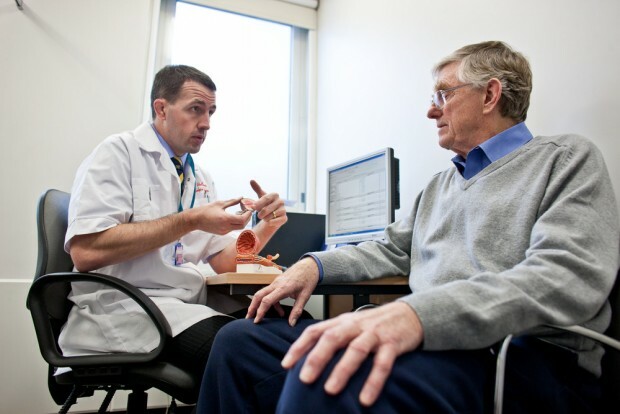 GPs and primary care professionals should only use the PCRMP to counsel asymptomatic men aged 50 and over who proactively ask about PSA testing for prostate cancer. It does not apply to their consultations with men at high risk or men with symptoms of any age. GPs should download and print out copies of the patient information summary sheet as required when counselling well men aged 50 and over. “The decision about whether a man takes a PSA test is a complex one and has to be thought through carefully. “There are potential harms as well as benefits in taking the test and we know that many men really appreciate the opportunity to discuss the test with their GP. Help us make the UK NSC recommendations webpage better! Thanks for the blog! The guidelines for GPs and primary care professionals are very helpful. The revised PCRMP resources incorporate the latest evidence and statistics around PSA testing for prostate cancer. We would therefore advise against using the old materials now as they are outdated. The summary information sheet for men is intended to be printed and given to men as part of a wider discussion with the GP about PSA testing and prostate cancer. It should be used in conjunction with the summary sheet for GPs and the full evidence document, which include information for discussion with men about the practicalities of taking the PSA test.